From left: Riley Mills, Kyle Hufford, Timothy Litwiller, Tabitha Immanuel. The FiveCore Media crew eats a meal with members of the Hutterite Community in South Dakota. 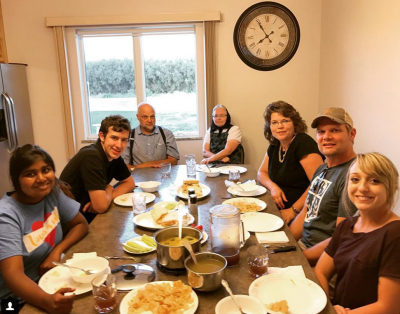 In August 2017, Tabitha Immanuel, a Goshen College senior from New Delhi, India, found herself in a place she never expected to be — at a dinner table with a Hutterite family near Freeman, South Dakota. She was there with two other students and a professor with the college’s video production company, FiveCore Media, recording the Hutterite dialect for a 75-minute documentary titled “Three Groups, One Story.” When the Hutterite family learned the film crew had not eaten yet, they invited them in for a meal. Immanuel, who is a film production and theater double major, along with film students Riley Mills, a senior from Milltown, Indiana, and Timothy Litwiller, a senior from Phoenix, as well as Kyle Hufford, assistant professor of communication and general manager of FiveCore Media, spent a week in Freeman, South Dakota, to film the documentary telling the stories of the Hutterite, Swiss Amish and Low German Mennonites who settled in the Freeman area in the 1870s. 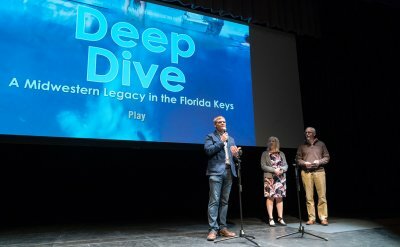 In fall of 2015, Marnette Hofer, an archivist for the Heritage Hall Museum and Archives (HHM&A) in Freeman and the film’s executive producer, pitched the idea of bringing together one historian from each ethnic group to tell the Freeman story. She met weekly with three local historians, Robert Engbrecht, S. Roy Kaufman and Norman Hofer, to choose stories and write a script for a presentation. 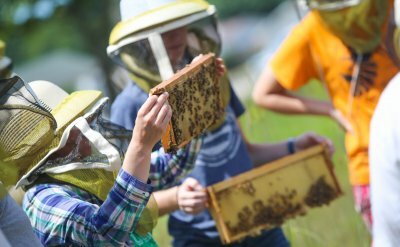 They presented their work the next spring at Schmeckfest — Freeman’s annual celebration of these three groups, their foods and their traditions — to a captivated audience, and began to think about ways to preserve and share the stories with a wider audience. 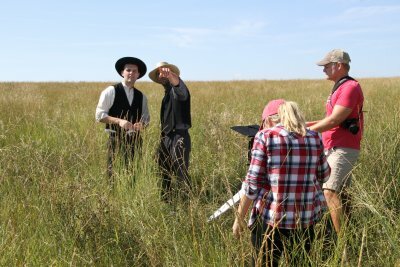 With a $3,500 grant from the South Dakota Humanities Council and a other crowdsourced funding, the project to create a documentary was set in motion. When Hofer, who is also the parent of four Goshen College alumni — Joshua (2011) Vanessa (2013), Alicia (2014) and Christina (2016) — was given the go-ahead to hire a video company to create the documentary, and reached out to several video production companies, including FiveCore Media. After some conversations with Hufford, Hofer insisted on going with FiveCore Media. Hufford said that he was reluctant at first to take on such a large project in a community they knew very little about, but he eventually came around. Riley Mills and Kyle Hufford film two local actors near Freeman, South Dakota. The week before travelling to Freeman, FiveCore Media created a mockup of the presentation in a large room to make sure they had everything they would need. The four-person FiveCore Media crew packed all of their equipment into a van for the 11-hour drive to Freeman. They got to work immediately upon arrival, scouting out shooting locations and meeting with Hofer and the historians that they would interview. “We were completely focused on the project the whole week we were there,” Immanuel said. 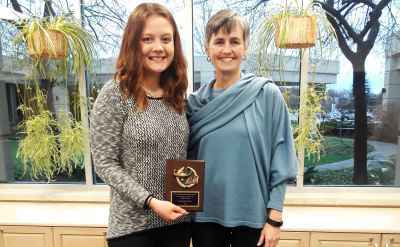 “Most days were at least 12 hour days, but that is the life of film production and its really good to have the students experience that,” Hufford said. They interviewed historians, gathered hundreds of photos to be included in the documentary and recorded music and people speaking the original languages and dialects of the different groups. They also worked with local actors to shoot realistic reenactments. After a week of filming, the FiveCore crew returned to Goshen and spent the next six months piecing the documentary together. Many versions were sent back and forth between Goshen and Freeman, and the final 75-minute film premiered March 4 at the Lund Theater in Viborg, South Dakota, and is being shown during Schmeckfest in Freeman this month. And for the students involved in the production side, it was not just an opportunity to gain first-hand experience shooting and editing a feature-length documentary, it was a chance to learn about three very unique groups of people.